Meal Planning Ideas are sure to help you answer "What’s For Dinner?" It's an age old question that seems to cause added stress to our daily lives. Dinner is the last meal of the day and a time when families can get together and discuss their day. 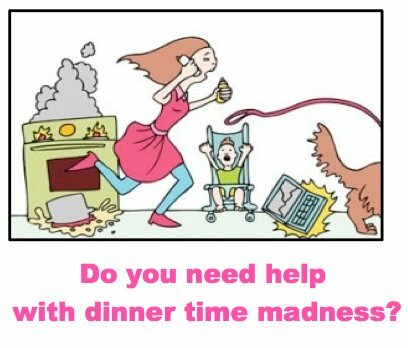 It is also a hectic meal for busy moms who are just getting off of work or who have been busy with other activities all day. If you are a busy mom or you know a busy mom, here are some menu planning ideas to help make dinner meals easy and even fun. 1. Schedule your meals a week in advance. This is one of the most important meal planning ideas. Knowing what you are going to eat throughout the week means less chance that you will stop off at the closest fast food joint for a convenient, but unhealthy meal. Decide on the last day of the previous week (let’s say Saturday for the sake of argument) what the menu will be for the following week. Create your shopping list from the list of ingredients to avoid buying what you don’t need at the grocery store. 2. Look for bargains. Clip coupons, read advertising circulars and the like to decide where the best grocery to shop is for your menu items. If one ingredient is a common denominator in many meals, consider buying in bulk to save money. Common staples like milk, eggs, bread and sugar can be bought in bulk as well. Some stores will have double or triple coupon days when you can save even more. Whats For Dinner Tonight? Easy Prep For 10 Meals! 3. Search online. After a while your family will get tired of chicken and rice every Thursday. You can get into a menu rut sometimes. Use the Internet to search for new and exciting recipes. Learn to put a twist on old recipes for a new taste. 4. Have a leftover night. After preparing meals for five or six days, there is bound to be some food left over. Designate one night to be leftover night and let everyone mix and match for dinner. It saves mom from having to throw away any food. 5. Cook your meals in advance. This is a great meal planning tip. After deciding on a menu plan for the week, go ahead and fix as many meals as you can. Choose a day when the entire family can help like Saturday morning or Sunday afternoon. Each person can take one meal and fix it for the following week. Once everything has cooled, store it in sealed containers or casserole dishes to be frozen until the night it is needed. No time to cook all of them...just prep, assembly and freeze then. Click here to learn about Freezer meals. 6. Do prep work in advance. All of the meals can’t be cooked at once. Some foods just taste better freshly prepared. For them, so as much prep work in advance as you can. Enlist your kids to help chop (give them the kitchen shears instead) vegetables, dice cooked meat and mix together dry ingredients. The night of the meal, all that is needed is to add the wet ingredients and bake. Meal time doesn’t have to be all on mom. The entire family can help with dinner using these meal planning ideas. With proper meal planning, it can be a relaxing meal for everyone.